I need advise from you wonderful Opal experts out there. I am finally cutting some nice Coober Pedy Opal rough. Here is my issue. Frequently, I seem to have a nice stone, but after being shaped and cut, it has a dead spot somewhere on it, often in the middle. I don't want to cut it out because that would really make the stone too small for my purposes and overall, the stone still looks very nice. The fire in other spots on the Opal is too thin to grind the entire Opal down but sometimes I think I can see fire below the dead spot. So my question is how can I try to get to that fire without damaging the thinish band of fire on the rest of the stone nearby that looks great? Can I try gently carving a tiny bit off the top with my flex shaft and if so, what exactly do I use for carving? Do I use some sort of rubber abrasive bit? Those cheapo metal diamond coated bits or are those likely to gouge the stone or crack it? I really haven't the foggiest as to what is advisable. Thank you! I am betting some diamond pacific abrasive bits in your flex shaft on this one, but not sure. It's 3am here, and I'm not the most awake, but one thing I'd like to ask before going any further would be in regards to the dome you are putting on your opals. If for some reason you are cutting a really high dome, this could affect the outcome of the stone, as fire tends to run in flatter "bars" (note: this is not always the case. Opal can vary wildly). Dead spots showing up in the center of a stone, or anywhere on the dome of it may just be the result of inconsistency in the color bar. That being said, if you're cutting your stones into a rough shape first, you should get a good general idea of where the fire is going to show before you've got it completely polished. -The color bars you are working with are very thin in general, thus any undulating in the structure might result in "peaks" getting cut all the way through (causing dead spots). -The stones you are cutting are too large (this leads, again, to changes in the structure of the color bar causing dead spots). For myself, personally, when I was cutting, I would generally expect to get, at most, 15mm on a side. Most stones were in the 1 to 2 carat range, so it was common to see 10mm on the long side of a given stone. Just late night thoughts. I'm far from an expert on it, and I've not had the chance to cut opal for a good 6 years now. Hmm, I do triplets so there is no dome. Seems like color is in sorta flat sheets. I cut down almost to the color desired and then glue the backing to the flat cab. Then I flip it over and flat lap it down to the best color I can get. The glue man made guard type glass over it and dome and polish the top. Otherwise I have cabbed blue opal from Mexico as a normal cab. The blue color is beautiful by itself and the fire flashes are a added good thing even if they are off center etc. I don't know blue Opal from Mexico. It sounds cool. Where do you get it? Got it from Tony/catmandew who owns Idaho Rock Shop in Quartzsite. I think John Huesler has a regular supply. Don't get me wrong, there is a general flatness to many color bars. Heck, with Idaho Opal, it's about as flat as you can get (which is why the quality stuff is generally only used for Triplets). OP is cutting Coober Pedy though. I've had a lot of trouble with material from some fields there, and mostly due to color bars showing best from the side, and somewhat randomly from the top. Other locations have pinfire patterns that are a really straight forward cut. Would it be possible to see some pictures of the material in question? I'm responding only to the question of how do you reduce the material in the "dead" area to get to a depth with better color. I think Phish posted the right answer. Diamond Pacific Mini-Nova points are sold in a variety of grits and shapes. They work very well in my Foredom; 3/32nd shaft diameter I think. Must be used wet - I simply dip them in a dish of water occasionally to keep them cool and clean. I often use them to eliminate small sandshot areas in opal cabs. My only caution would be to be careful about the grit you choose to start. Aggressive grits remove stock quickly but leave deep scratch marks that can be very difficult to remove. I'd start with something like 600 or maybe even 1200 to see how it goes, moving to something more aggressive only if needed. Opal's soft and grinds pretty fast as you know. For final polish I use small felt buffs with cerium oxide. They generate heat when they dry out so be careful not to overheat the opal. Yes, NOVA minipoints is exactly the kind of thing I was thinking of. I know for carving I was previously advised to use bamboo skewers and toothpicks in a flexshaft with diamond paste, but that sounds way messier and I'd prefer to avoid that if Nova has a point type bits available. 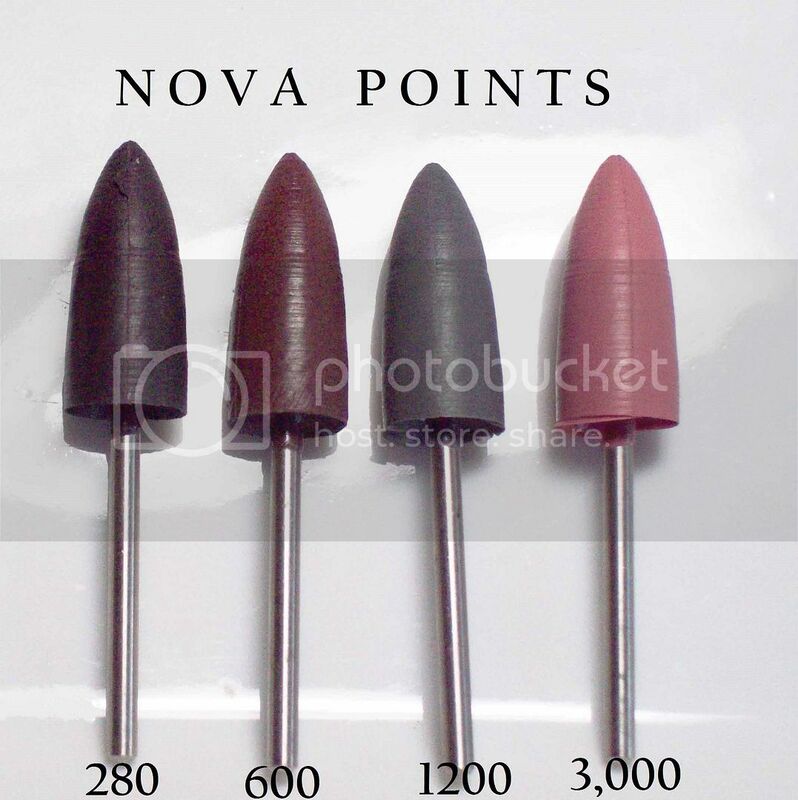 Does anyone know where you can get Nova mini-points? Everyone seems to have the mini-wheels for the flexshaft but the only points I am finding are in Australia! BTW, I am having trouble getting a decent picture, but this is the opal., The color bar was at an angle and it was thinnish opal on sandstone, but maybe I did dome it too much! However, the dead spot is where there was also a spot of sandstone on top I had to remove. Google "Diamond Pacific Mini-Nova Points." Nah, don't think you domed it too much in this case. Just looks like a generic dead spot. If the carvers here say you can carve it out, go for it. If there's fire underneath it should show nicely, but you'll definitely need to add some shape to it, otherwise it will just be a cabochon with a polished hole in it. :) Carving is waaay outside my realm, so have to go with what others have said on how to go about it. Cristopher anthony here in the forums is a diamond pacific dealer, he should be your "go to" fella for what you need, he sells a pack of tips to the rock carvers on facebook. I just sent him a message, he will be here shortly to help with what you need. How do we order? Facebook? A Facebook PM works our you can email me at cajewelrydesign@gmail.com.